At Mollie Sharp’s we care about the environment and, therefore, food miles. To enable us to bring you the finest product ranges there are certain things we do to help create a good balance and help reduce our carbon footprint. We source many products from local and small producers including beers and spirits produced right in the heart of Selby. Additionally, all our packaging is recycled or reused. This is why when you order from us you may not get the prettiest box but hopefully you’ll agree it's what’s on the inside that counts! 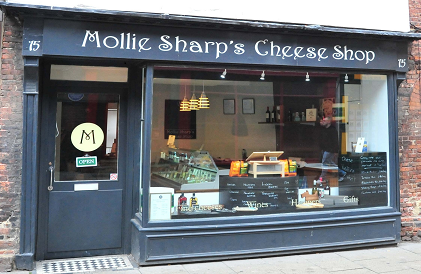 At Mollie Sharp’s you will find a wonderful selection of fine cheeses; beers, wines & spirits; hampers; gift items and more. Based in Selby, North Yorkshire since October 2010 we have a fantastic range of products that have been carefully selected for you and can easily help you create the perfect pairings with our knowledge and passion for food and drink, with locally sourced items being high on our agenda.